The hotel has 164 rooms. 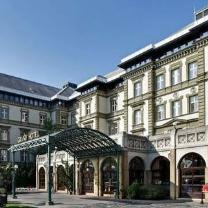 Szechenyi Restaurant with garden terrace, international, Hungarian and dietetic cuisine, Grill Terrace, Begonia Café and terrace, Gosser Brasserie, Eskimo Ice-cream-salon, Victoria Drink Bar, 18-hours room service. Perfect location for garden parties.